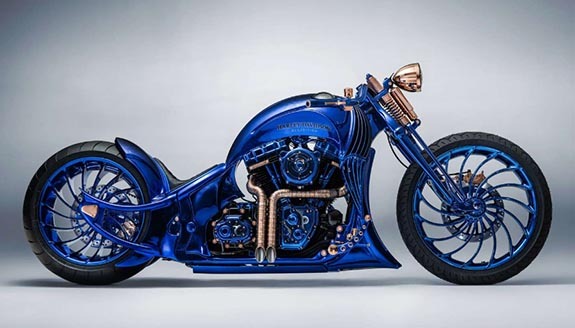 The $1.9 million “Blue Edition” Harley-Davidson is adorned with 360 diamonds, including a 5.4-carat diamond ring displayed under an armored glass compartment built into one side of the tank. 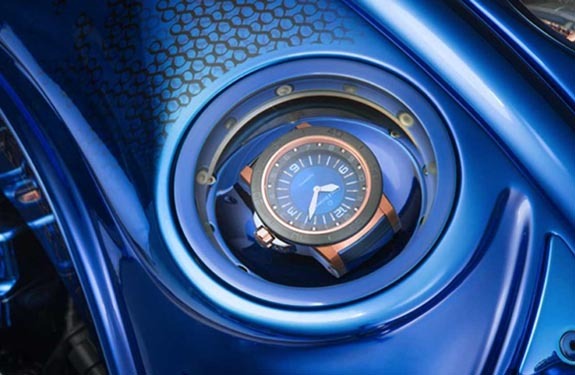 Located under a second dome on the opposite side of the tank is a Carl F. Bucherer custom-made watch. 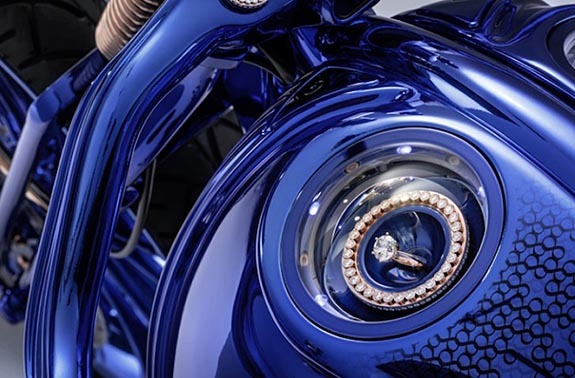 Bucherer’s unique “Dizzler” rotating diamond rings are seen in a number of places on the bike, including smaller ones on the handgrips and forks and a larger one on the left half of the tank. 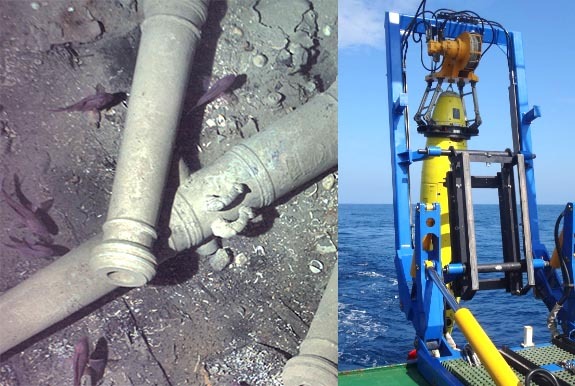 Utilizing an unmanned submersible vehicle at a depth of 600 meters, researchers at the Woods Hole Oceanographic Institution (WHOI) positively ID’d the San José — a 62-gun, three-masted Spanish galleon that has been called the “Holy Grail of Shipwrecks.” The ill-fated ship had been en route to Spain in 1708 laden with a cargo of emeralds, precious-metal coins and jewelry estimated to be worth $17 billion. 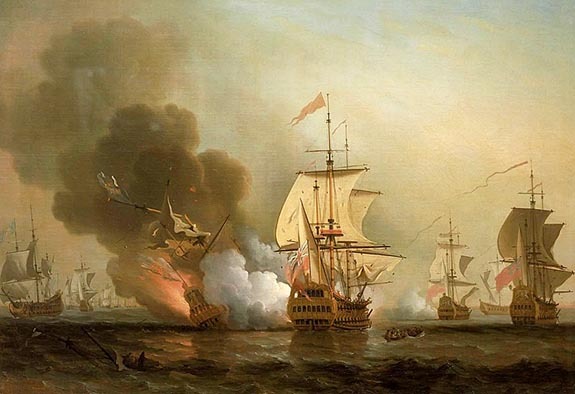 A quartet of British warships sank the galleon near Colombia’s port city of Cartagena, and for hundreds of years, treasure hunters speculated about the exact location of the wreck and the untold riches it contained. WHOI researchers maneuvered the REMUS 6000 robotic submarine to within 30 feet of the wreck — close enough for cameras to capture images of the distinctive dolphins engraved on the ship’s massive bronze cannons. 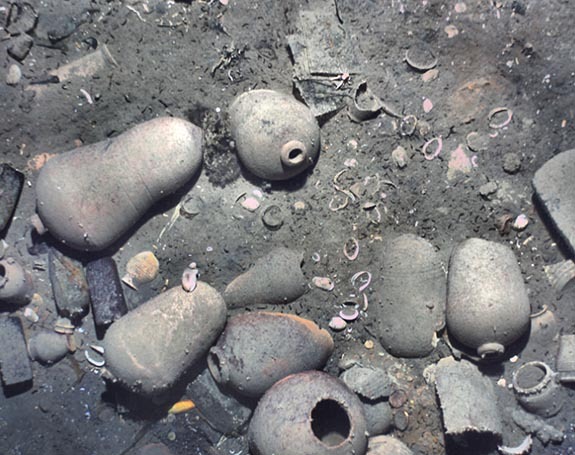 Researchers believe that all the San José’s treasures remain intact. 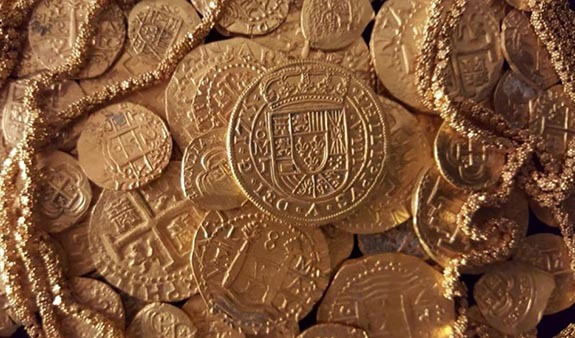 The Colombian government is currently raising funds for the recovery effort that should yield millions of gold and silver coins, as well as fine jewelry and a bounty of Peruvian-mined emeralds. It also plans to build a museum and world-class conservation laboratory to preserve and publicly display the wreck’s contents. 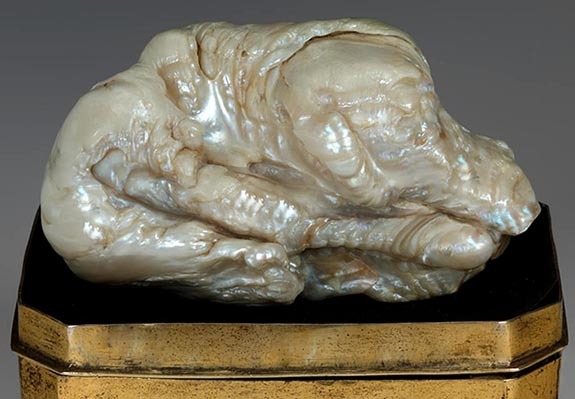 Once owned by Catherine the Great, the world’s largest known freshwater blister pearl is expected to fetch more than $600,000 when it hits the auction block in The Netherlands this Thursday. 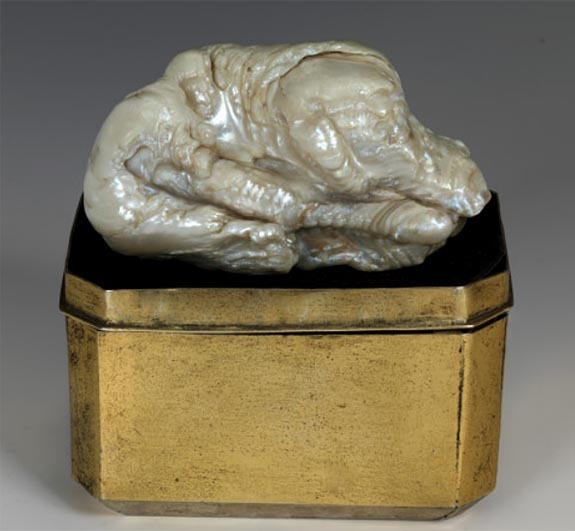 Dubbed “The Sleeping Lion” due to its unusual shape, the extraordinary quarter-pound natural pearl is more than 2.7 inches long and was likely formed in China between 1700 and 1760. The Amsterdam Pearl Society purchased the pearl in 1979 with the goal of researching The Sleeping Lion’s composition and history. On Thursday, the Society will be offering the pearl for sale during the Venduehuis auction in The Hague. The Venduehuis der Notarissen is the oldest Dutch auction house, founded in 1812. The Sleeping Lion is considered a blister pearl, which means that it formed while attached to the inside surface of a mollusk’s shell. This causes blister pearls to be flat on one side. Coming off a three-day viewing in The Hague, The Sleeping Lion will be Lot 1778 at Thursday’s auction. 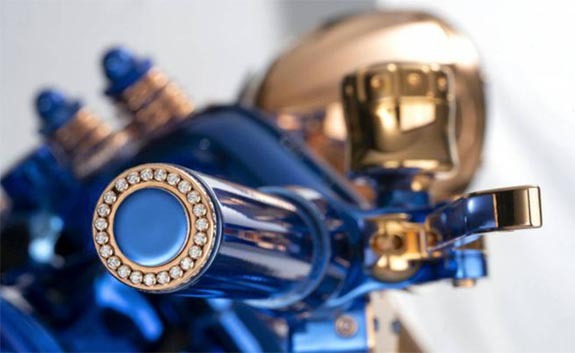 Venduehuis estimated the piece would sell in the range of $395,000 to $628,000. The pearl is being offered along with its original custom-made brass case. Welcome to Music Friday when we bring you great songs with jewelry, gemstones or precious metals in the title or lyrics. 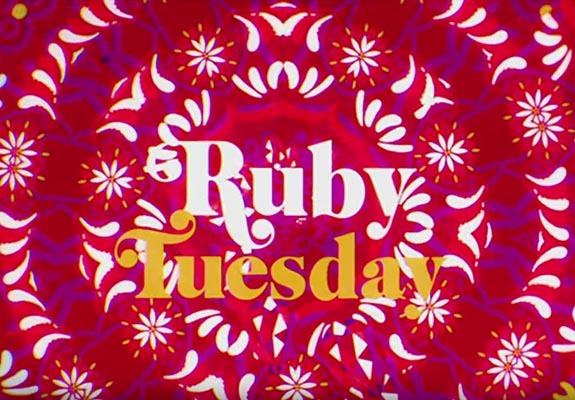 Today, we present The Rolling Stones’ newly released, kaleidoscopic lyric video of their 1967 smash hit, “Ruby Tuesday.” The video premiered on Tuesday, of course, to promote the group’s 2018 European tour, which kicks off tonight in London. Composed by Keith Richards and Mick Jagger, the hauntingly beautiful ballad is our pick for the most popular “ruby” song of all time — even though it’s about a lost love and not about the coveted scarlet gemstone. In his autobiography, Richards noted that “Ruby Tuesday” was inspired by an emotionally devastating breakup with his girlfriend, Linda Keith, who left him for a poet. “Ruby Tuesday” had been intended as the B side of “Let’s Spend The Night Together,” another Stones hit, but radio deejays at the time were uncomfortable with the adult theme of the A side, and chose to play the flip. Today, the 45 is referred to as a double-A-sided record. Septuagenarian rockers Jagger, Richards, Charlie Watts and Ronnie Wood will be performing “Ruby Tuesday” on their “No Filter” tour, which runs through July 8 and will take the band throughout Europe. Diamonds, in addition to being beautiful gemstones, hold great symbolic weight in our culture. Besides revealing wealth and prosperity, they symbolize an enduring commitment. They weren’t always a symbol of a marital engagement, however. Rings themselves, but not necessarily diamond ones, have been used to telegraph betrothal since Roman times. 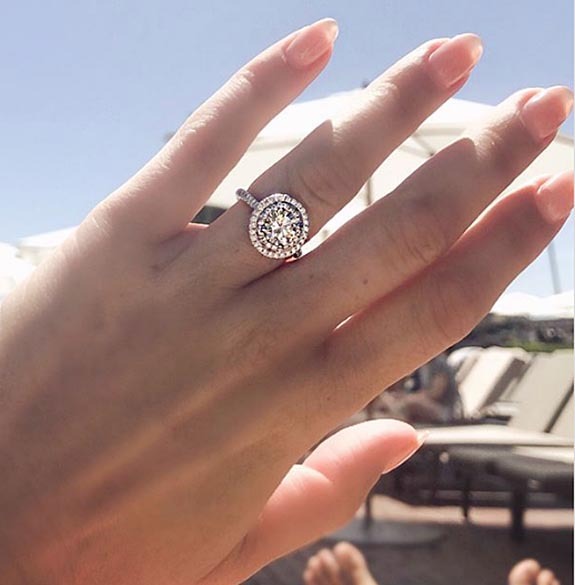 It wasn’t until the Archduke Maximillian of Austria offered a diamond engagement ring to Mary of Burgundy in 1477 that such a gesture entered the Western psyche. 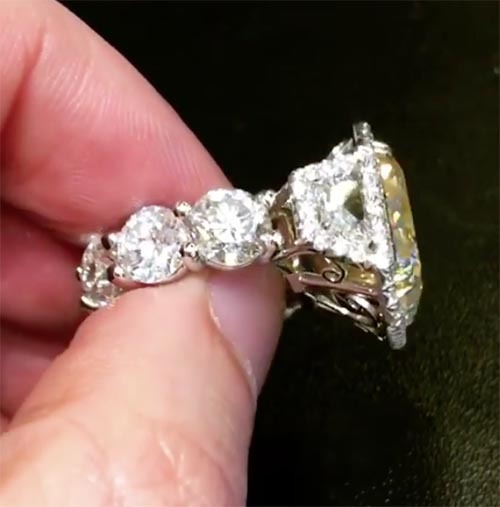 Even then, it wasn’t a common practice until 1947, when the De Beers advertising campaign married the diamond ring to engagement with its now-famous slogan, “Diamonds are forever.” Ever since, a diamond ring has become the standard accessory for a marriage proposal, silently communicating a man’s devotion to and love for his fiancée. Surprisingly, despite the weight they carry in our culture, we don’t actually know very much about the gemstones themselves. For instance, you may have been taught that diamonds are formed from a piece of coal that endures tremendous pressure for a considerable length of time. However the gems are actually made of pressurized, crystallized carbon and are created in one of four ways—none of which have much to do with coal. There are two main places diamonds form, either inside the Earth or outside our atmosphere in space. So how exactly do they form? Diamonds under Earth’s surface are formed from igneous rock within vertical pipes, much like a natural shaft, either in Earth’s mantle or in subduction zones—where two tectonic plates come together and one is forced down underneath its counterpart into the mantle. Almost all the diamonds that have been mined today were formed in Earth’s mantle, under a tremendous amount of pressure and incredible heat—specialized conditions that mean there’s a limited number of places that they can form. Diamonds in the mantle form at least 90 miles (150 km) down, at temperatures of 2,000 Fº (1,050 Cº) or above. Now and again, deep-source volcanic eruptions push the diamonds up to the surface via fast-traveling magma, which passes through what is called a diamond stability zone, breaking off pieces of rock known as xenoliths and carrying them—and the diamonds they contain—to the surface. Miners have called these “volcanoes of opportunity”. Telltale shafts of volcanoes, called lamproite or kimberlite pipes, signal to prospectors that diamonds may be present—and where you find one, you usually find many more. What’s incredible about these deep-origin diamonds is that water or other substances can get caught in them as they’re forming, giving geologists clues about what exists far below Earth’s surface. In fact, a recent paper published in the journal Science reports the finding of a super-dense type of crystalized ice (ice-VII) inside a diamond. This kind of ice is so-far found nowhere else on Earth, but may be common elsewhere in the solar system, such as on Jupiter’s moon Europa. The second way these precious stones are formed is in subduction zones, which are created by the epic collision of tectonic plates. When two plates meet and one forces the other underneath it, great pressure and temperature builds up. Here, diamonds may form much closer to Earth’s surface, around 50 miles (80 km) down. Temperatures can reach around 390 Fº (200 Cº) or higher. Oceanic plates, due to their high density, are more likely to experience subduction and since they often carry types of rocks high in carbon and perhaps even the leftovers of former plant life (some coal), diamonds are much more likely to form. Those rocks that are subducted and make it back to the surface are thought to contain diamonds. Since few are found on the surface, and those that are tend to be small, no commercial operation currently looks for such deposits. Meteorites are good sources of nanodiamonds. These are minuscule, each merely a few billionths of a meter wide. Large numbers of such diamonds were found by Smithsonian researchers within the Allen Hills meteorite. NASA scientists have discovered nanodiamonds contained within other meteorites as well. Lots of carbon can be found in such space-borne rocks, and about 3% of it is usually comprised of microscopic diamonds. These rocks are thought to have been formed during collisions with asteroids and other celestial bodies. Unfortunately, nanodiamonds are too small for industrial or commercial use, at least currently. The last way diamonds are produced is when an asteroid strikes Earth, causing the high temperature and pressure required to form these precious gemstones. Tiny diamonds have been found at many asteroid impact sites around the world, including the Popigai Crater in northern Siberia, and Meteor Crater in Arizona. To find out about a place where you can search for diamonds yourself, click here. 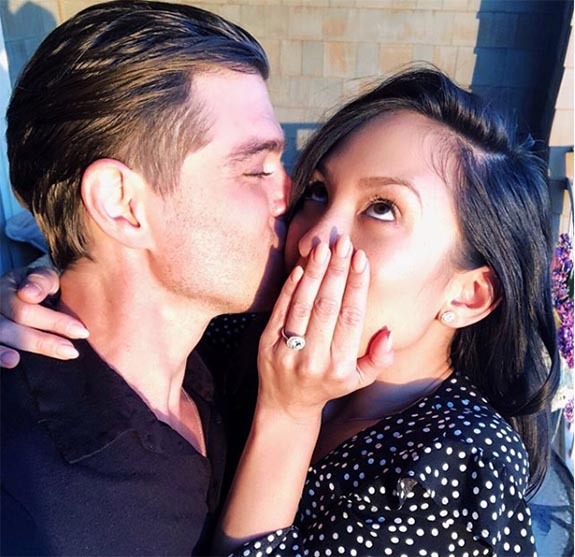 Dancing With the Stars pro Cheryl Burke got engaged to Boy Meets World alum Matthew Lawrence in early May, but took to her Instagram just last week to reveal the sweet and sentimental elements that make her double halo diamond engagement ring truly unique. According to people.com, Lawrence, 38, recruited his future mother-in-law and his own mom, Donna, to assist with the redesign. Together, they worked with a jeweler to come up with the current look. 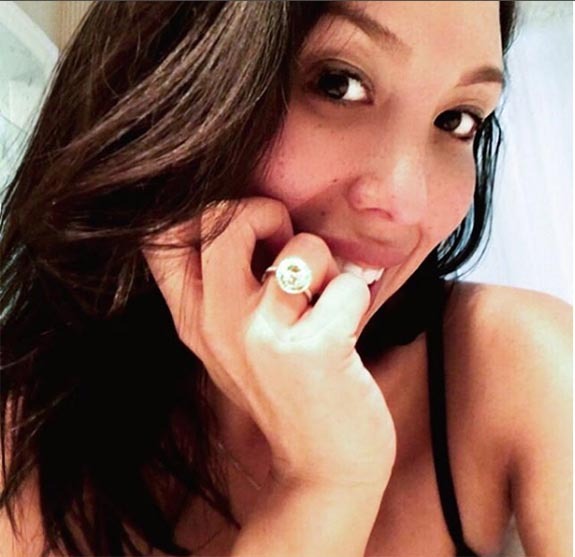 Burke accepted Lawrence’s surprise proposal and the beautiful new ring on May 3, the dancer’s 34th birthday. 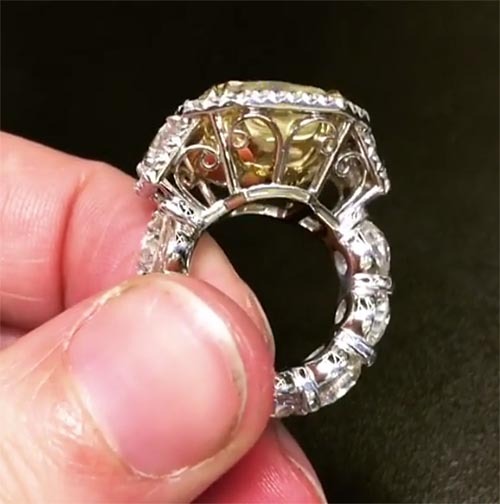 The platinum ring, which was designed by New York’s Pristine Jewelers, features a modified radiant-cut yellow center stone surrounded by a halo of 36 small, round colorless diamonds. The dazzling band is adorned with eight 1.5-carat round colorless diamonds, bringing the total diamond weight to more than 30 carats. 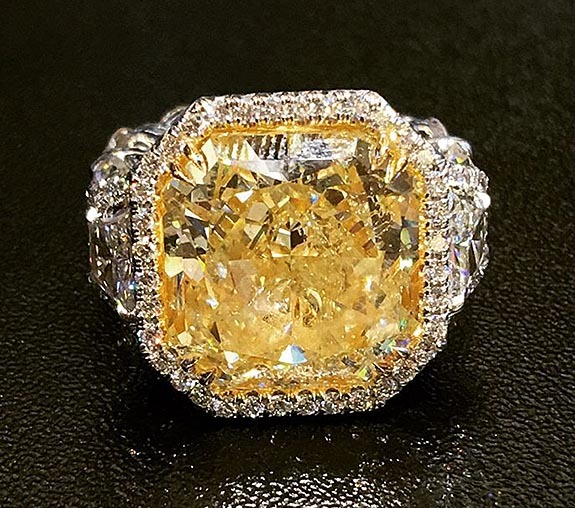 Conflicting reports place the value of Iyanna’s canary diamond ring somewhere between the “high six figures” and $5 million. 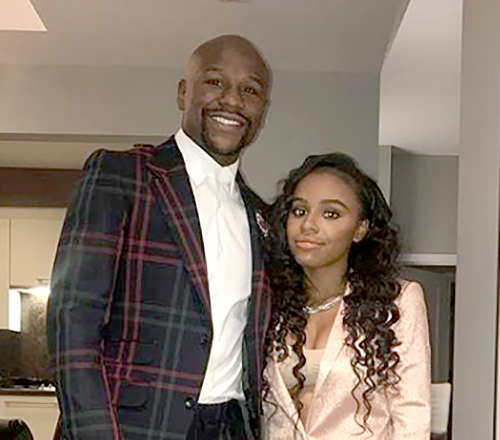 Avi of Pristine Jewelers told PageSix.com that the champ wanted “something different” because his daughter already owned a lot of white diamond rings. “He wanted something to pop out and stand out,” the jeweler noted. Marlyn Sanchez is well known at Marlins Park in Miami because she’s frequently called on to sing the national anthem. So, when her boyfriend, Ralph Cabrera, arranged for her to throw out the first pitch before Wednesday’s contest between the Marlins and the Dodgers, Sanchez didn’t have a clue that he had plotted the perfect marriage proposal. Dressed like a Marlins player and masked in full catcher’s gear, Cabrera crouched behind the plate as his girlfriend stepped on the pitcher’s mound, wound up and spiked the pitch — wide to the left. Her boyfriend scooped up the wild toss and hustled to the mound to give her the ceremonial ball. Sanchez’s embarrassment at throwing such an off-target pitch quickly turned to elation when Cabrera unmasked himself, dropped to one knee and opened a custom ring box that happened to be in the shape of a baseball. 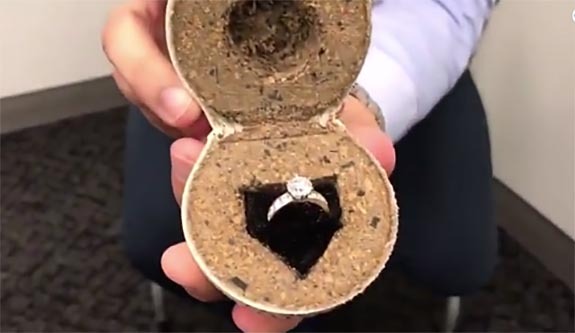 Slotted in the box was a diamond engagement ring. In front of the Marlins’ hometown fans, Cabrera asked Sanchez to marry him and she instantly nodded yes. 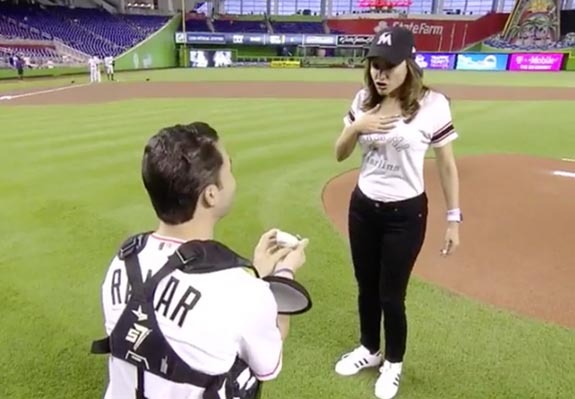 Miami Marlins broadcasters, who were covering the ceremonial first pitch and proposal in real time, suspected that something was awry. Typically, the person receiving the game’s first pitch doesn’t come out in full catcher’s gear. Also, the masked catcher was wearing a #1 jersey with the name “RAMAR” on the back. Sanchez revealed in a pregame Twitter video that the name represented a combination of the first letters in the names Ralph and Marlyn. The #1 symbolized that the couple would soon be united as one. 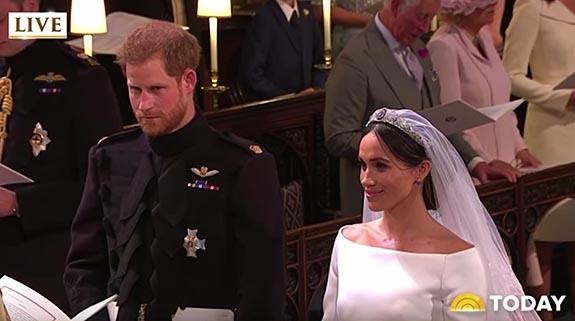 An estimated 3 billion people worldwide tuned in Saturday to see American Meghan Markle tie the knot with Prince Harry of Wales, and much of the buzz about the romantic royal nuptials was focused squarely upon the bride’s diamond tiara. 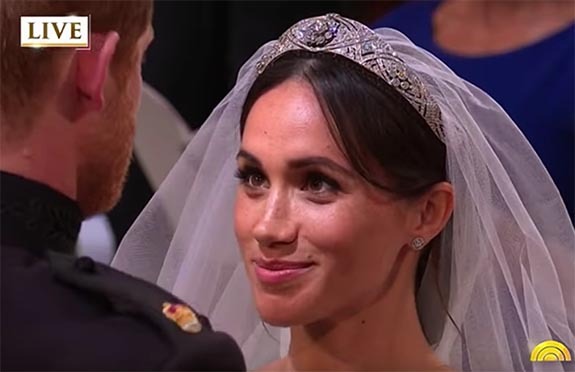 Holding Markle’s veil in place was the Queen Mary Diamond Bandeau Tiara — a stunning piece lent to the young bride by 92-year-old Queen Elizabeth II. The platinum tiara was originally made for Queen Mary in 1932 and incorporates a removable center brooch that dates back to 1893. Prior to Saturday’s royal wedding, there was some speculation that the bride might forgo tradition and have a new tiara designed for the occasion. In the end, Markle decided to pay homage to her new family by wearing an accessory from the Queen’s jewelry collection. 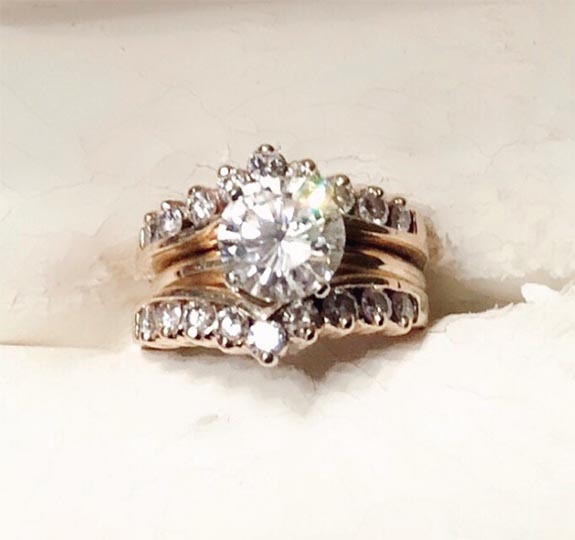 The bride’s Welch gold wedding band also reflects a long-standing royal tradition. For the past century, royal wedding bands have been crafted from rare Welsh gold, sourced at the Clogau mine in Bontddu, Wales. The mine dates back to the Bronze Age, and commercial mining began there in the mid-1880s, according to a report by CBS News. The mine was closed in the 1990s, but Queen Elizabeth II had received a kilogram of the rare gold for her 60th birthday in 1986. 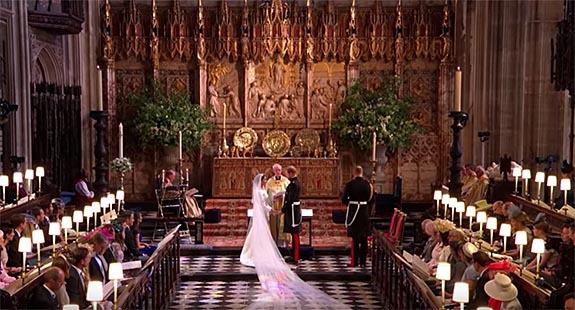 CBS reported that the Queen’s reserves have been the source of royal wedding bands ever since. While the bride will be wearing a gold wedding band, Prince Harry opted for a platinum band with a textured finish. “Primadonna” was the lead single from the 32-year-old artist’s second studio album, Electra Heart. MTV Buzzworthy critic Sam Lansky described “Primadonna” as “a monster song,” and fans across the globe agreed. The song was an international sensation, reaching the top five in three countries and charting in 13. Within the first few hours of its release in March of 2012, the song became a worldwide trending topic on Twitter. Born in Brynmawr, Wales, Diamandis moved to London as a teenager to pursue a music career. In 2009, at the age of 24, she placed second in the BBC’s “Sound of 2010” competition. That success led to her debut studio album, The Family Jewels.